Zack Kong, CEO and founder of TwentyFifty Fork, at left, and his mentor Albert Liu. 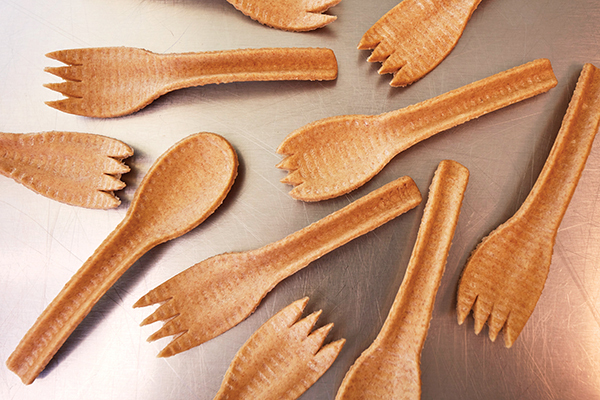 The company produces compostable utensils. “The plan is to produce 180,000 a day to start, and then, by the end of next year, 300,000 units per day, for a total of close to 10 million a month,” said Liu. Photo by Stephen Whalen. San Diego  It wasn’t until March of this year, after introducing his creation at the Natural Products Expo West, a natural, organic and healthy goods event in Anaheim, that Zhicong “Zack” Kong, CEO and founder of TwentyFifty Fork, a compostable cutlery company, decided to speed up plans to begin mass manufacturing his natural grain-based fork. “That is where we saw all this interest — people were saying it was the most important product at the show,” says Albert Liu, Kong’s mentor, who is helping Kong bring the cutlery, which composts in 14 days, to the market. “All the major food brands were there,” which is what compelled the pair to speed up production. Now, Kong, a 2017 bioengineering alumnus from UC San Diego, and Liu, also a UCSD alumnus, have fast-tracked the company’s manufacturing initiatives, with plans of launching a Kickstarter campaign at the end of July with a goal of raising $30,000, followed by the opening in August of a manufacturing plant in Oceanside, where the company is headquartered. “We will invest that money in the production line machine and the new warehouse,” said 26-year-old Kong, who raised money from friends and family to get things started and hopes to get investors to donate once manufacturing kicks off. “The plan is to produce 180,000 (utensils) a day to start, and then, by the end of next year, 300,000 units per day, for a total of close to 10 million a month,” Liu said. Although TwentyFifty isn’t officially selling products yet, it has orders from “health food stores, natural grocers, food service establishments, a list of universities, and larger establishments like major national grocers,” said Liu, naming UCSD and Whole Foods as two of the entities that TwentyFifty Fork is working with. Kong submitted a patent last year for 30 formulations of the high-strength, heat-resistant (up to 170 F) utensils, including gluten-free versions. The product has a six-month shelf life while in the package and can be broken into pieces, put in dirt and watered in order to compost. The instructions on how to dispose of the utensils will be posted on the company’s website and possibly on the individual packaging.